Nineteen years after writer/director M. Night Shyamalan's sophomore effort, Unbreakable, and two years after he confirmed his return to form with Split, the unique auteur has concocted what is the third film in an unlikely, but not so unlikely trilogy given the twist in Unbreakable was that all-along viewers were watching the origin story of a new hero and his arch nemesis yet were unaware of it. Like Unbreakable, Split was marketed under the guise of a different genre than what its true intentions held and when that original, James Newton Howard score re-emerged in those final moments of Split almost two years ago to the weekend it was one of the greatest "twists" I've ever had the pleasure of experiencing in a theater. This inadvertently created an issue for Shyamalan though, as with this trilogy-capper, Glass, there is no disguising what genre this film belongs to: this is a super hero movie through and through. And so, for a director who has made a name and a career off of the misdirect and/or "twist ending" the challenge in penning his first, unabashed sequel would be that of how might he might continue building these characters organically while integrating them into one another's respective worlds as well as framing the continuation of their story through a device that would satisfy the intrigue and sustain the investment. The idea that James McAvoy's "Beast" or Kevin Wendall Crumb as we know he truly exists is in the same world as Bruce Willis' David Dunn and Samuel L. Jackson's Elijah Price made for some exciting prospects, but where would Shyamalan actually go with things? How would these three individuals find their way across one another's paths and even if they happened to meet-what might it ultimately amount to? These are big questions that require much ambition and follow-through and while Shyamalan has been saying since Unbreakable opened in 2000 that he's had ideas or plans for a follow-up the time has finally come to put up or shut-up and for the most part, it's a good thing Shyamalan doesn't shut-up. With Glass, the filmmaker certainly has much to communicate and much he wants to say, but one will be hard pressed to figure out how all of these (broken) pieces are meant to fit together. 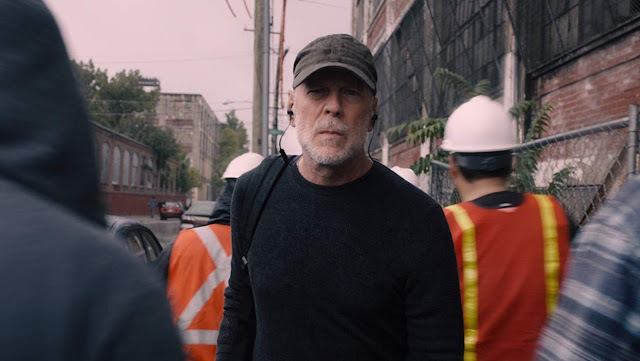 Bruce Willis returns to the role of David Dunn that he first embodied in 2000's Unbreakable. From the outset, it looked as if Glass would not only expand on McAvoy's Kevin, but bring audiences up to date on what David and Elijah had been up to in the nearly twenty years since that fateful train crash (though the trailers made it safe to assume Elijah had been rotting away in mental hospitals the entire time). As with all Shyamalan films it is important to play the beats of the story as close to one's chest as possible, but in the broadest sense of a synopsis we are brought back into the world through the character that started all of this AKA Dunn who, along with the help of his son, Joseph (Spencer Treat Clark), has been quietly patrolling the streets for some time and upgrading his career from that of a stadium security guard to owning his own security system shop. While it might have been more interesting if we were let in on whether the same trends that have come to fruition since the release of Unbreakable in the real world-meaning the rise of comic book movie-also took place in the world of Dunn thus allowing Shyamalan to attribute the increased attention to Dunn and the spread of this "delusion" to something more and bigger than just fate, but that isn't the twist (or one of the multiple twists) in Glass. Despite as much, this idea that people believing they have super-human abilities does lead to the introduction of new character, Dr. Ellie Staple (Sarah Paulson). We learn rather quickly that Staple is working in the ever-growing field of those real-life humans who actually believe they have supernatural abilities, but one of the first signs of trouble in the film is that we never get a sense of this growing epidemic. There is no wing of the psych ward where Staple works that's filled with characters we don't yet know nor are there any whispers of possible other beings like Dunn or Crumb; outside of these three individuals we've already come to know this doesn't seem to be an issue. 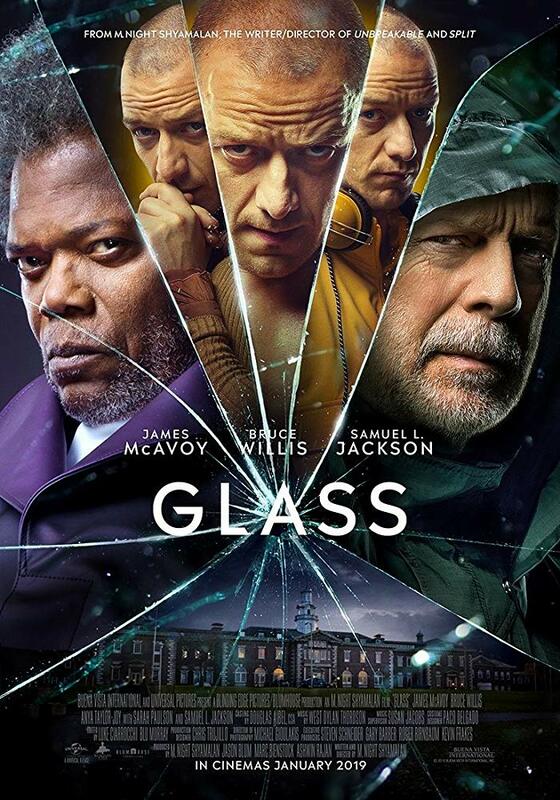 To combat this criticism, Glass is purposefully a smaller-scale film that is keen to keep its stakes fairly low in an attempt to upend the conventions of comic books Shyamalan is simultaneously keen on dissecting, but he executes this in such a way that most of the time the movie feels like, "look how smart I'm being," as the director conveys these ideas as if he were giving a lecture rather than showing us these deconstructions through action that would make the audience sit back and suggest, "how smart the movie is being." Given the ambition, but taking into account the perplexing decisions made in order to fulfill that ambition, Glass is a particularly tough nut to crack. It desires to accomplish and create so much more than the empty feeling one is left with when the credits finally begin to roll. In this way, one is left to largely admire the more obvious and more technical aspects of the production. For example, it was clear after Split that McAvoy was onto something special in his performance as an individual with D.I.D (Dissociative Identity Disorder) or Multiple Personality Disorder as it is more commonly known as well as a person who just, mentally, was not well. But while we only caught a glimpse of a handful of the personalities that lurked within Kevin in his inaugural film in Glass we are able to bear witness to nearly all of the said to be twenty-four personalities he possesses. And make no mistake about it, while the movie is named after a different character and Shyamalan has said and this has been touted more as a sequel to Unbreakable, it is just as much a sequel to Split as McAvoy is the star. The personalities are cycled through rather quickly thanks to an easy little narrative trick Shyamalan utilizes through the character of Staple and within the confines of the mental institution where the majority of the movie takes place. Some of the personalities blend together while others would certainly be worth spending more time with if the movie had that option of give us, but while there are certain, individual moments where it might feel as if McAvoy is getting a little showy or a little too self-indulgent with just how broadly he's laying out examples of the different people these personalities represent the skill necessary to keep each of them straight in his mind, keep them effective in the performance, and transition from one to the next without a hitch is more than impressive and the actor seemingly pulls as much off without breaking a sweat (unless he's the beast of course, by which he's a naturally slimy dude). Willis is thankfully more invested than he's not, but I wish there were more of the character overall as this is the guy we, the audience, are most connected to. 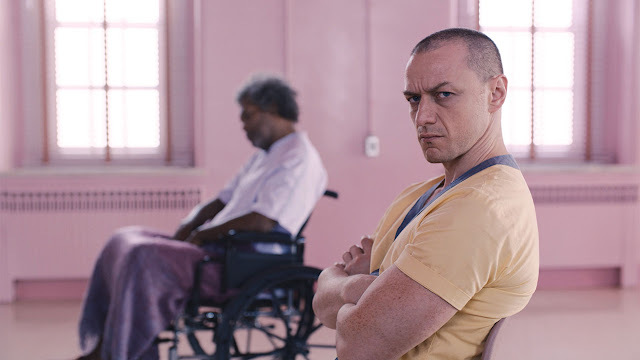 Jackson is most definitely here for it though, as the typically larger-than-life personality is resigned to a wheelchair and largely wordless performance for a fair chunk of the film, but still leaves an indelible impression as the titular Mr. Glass. 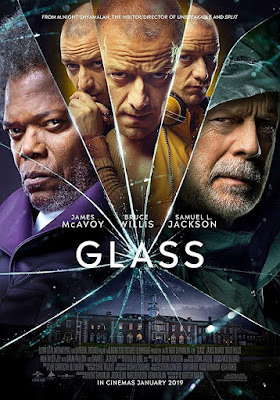 Elijah Price (Samuel L. Jackson) and Kevin Crumb (James McAvoy) are bad guys who decide to team-up in director M. Night Shyamalan's Glass. Ultimately, Glass tries to do too much, but accomplishes very little in the end. For all the weight this film should carry as is outlined in the initial paragraph of this review-the film itself produces little to nothing that impacts the viewer on an emotional level and that’s saying something given the events that unfold in the final twenty minutes of the movie. What Shyamalan is using this scenario to communicate-a message about the powers that be keeping people that are truly exceptional down so as to maintain a societal balance and convince the masses they are only capable of so much-leaves the audience cold to a collection of characters and tropes that might have elicited both real sorrow and inspiration had it simply capitalized on some of the tropes it tries so hard to dismantle. A cliche is only recognized as a cliche when it’s done poorly. It’s not that the film is either actively bad or threatening levels of mediocre either, but rather that it has fits and starts of real greatness as well as utter terribleness to boot. This leads, more than any other feeling, to disappointment given the moments that do genuinely hint at what expectations the previous films had set this finale up for are in fact pretty damn great. For the first half-hour or so of the film it sells exactly what one would expect a clash of Unbreakable and Split to be and that is to say it does admittedly cash in on many of the things that were easy to assume said mash-up would include, but it genuinely is thrilling to see Willis in this world again, Clark-Treat back playing his son, and there is a solace in knowing the two have remained close and continued working together to rid their corner of Philadelphia of the creeps that lurk in the streets. It follows logic that in light of Dunn hearing the news of the kidnapped girls and this so-called “beast” being on the run that he would begin to try and track the guy’s movement and their inevitable confrontation is on full display, but once Staple enters the picture and the three leads are boiled down to sitting around in padded and/or cells with hoses rigged up so as to be analyzed and convinced of their own self delusions the film seemingly devolves from being both a satisfactory sequel and contemporary contradiction to every other comic book movie out there to a largely lifeless exercise in spouting nuggets of genre commentary where the actions of the characters couldn’t feel more forced to fit their director’s ideas. All of this leading to an unrefined and anticlimactic finale that never once feels genuine in concluding all that has come to affect these characters in the past. Glass is a mess of ideas and muddled execution.